All those are permissively licensed for re-use via Creative Commons, which Aaron helped create before he could shave. I hope that’s true. But it would have had a much better chance if he were still here doing what he did best. We haven’t just lost a good man, but the better world he was helping to make. 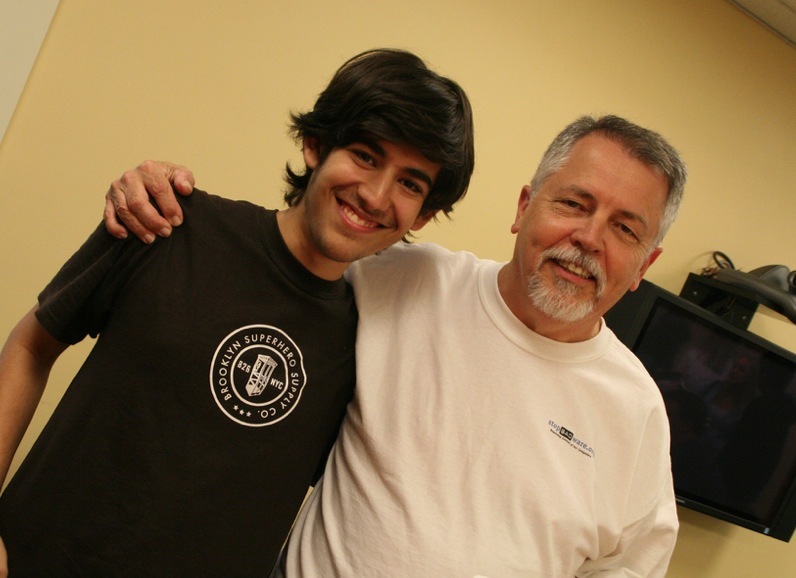 [Aaron] is gone today, driven to the edge by what a decent society would only call bullying. I get wrong. But I also get proportionality. And if you don’t get both, you don’t deserve to have the power of the United States government behind you. 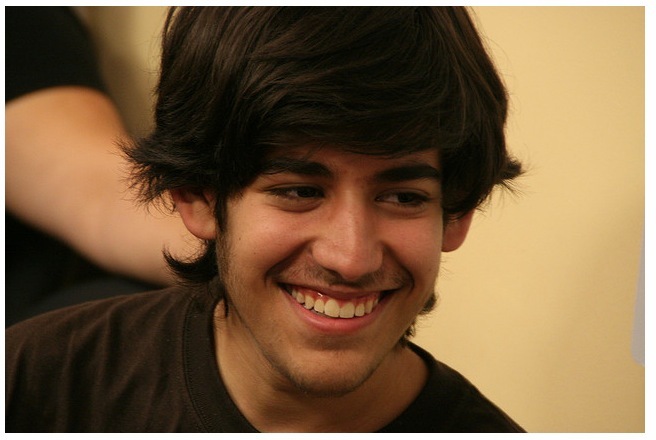 Our beloved brother, son, friend, and partner Aaron Swartz hanged himself on Friday in his Brooklyn apartment. We are in shock, and have not yet come to terms with his passing. Aaron’s insatiable curiosity, creativity, and brilliance; his reflexive empathy and capacity for selfless, boundless love; his refusal to accept injustice as inevitable—these gifts made the world, and our lives, far brighter. We’re grateful for our time with him, to those who loved him and stood with him, and to all of those who continue his work for a better world. Today, we grieve for the extraordinary and irreplaceable man that we have lost. Funeral and other details follow at the bottom of that post, which concludes, Remembrances of Aaron, as well as donations in his memory, can be submitted at http://rememberaaronsw.com. Also, via @JPBarlow: “Academics, please put your PDFs online in tribute to @aaronsw. Use #pdftribute.” Here’s the backstory. 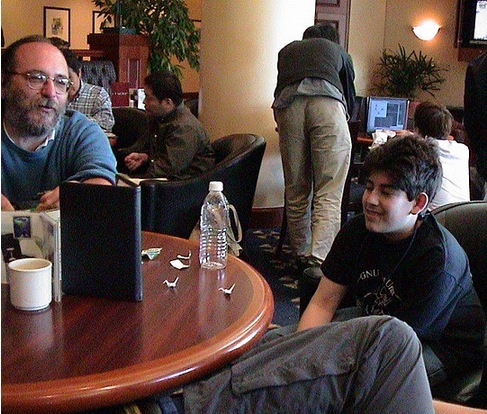 A memorial tweet from Tim Berners Lee (@TimBerners_Lee): Aaron dead. World wanderers, we have lost a wise elder. Hackers for right, we are one down. Parents all, we have lost a child. Let us weep. Online Grieving (Dave Winer) I have a comment that follows. I’m angry almost beyond measure about the abuse that lead to this. I’ve signed the petitions to have Aaron pardoned, and to have Carmen Ortiz removed, and I ask you to consider doing the same. A nicer parallel universe with Aaron still alive and well has been split from this one. The rot extends further than the digital sphere. Guantanamo, the war on Whistleblowers, the drone executions, the extended wars in Yemen, Pakistan, Sudan, Somalia et al. The endless business of killing. Thanks for all the help in filling out this post, to everybody who has written or tweeted me, privately or publicly. This is such a heavy thing, but it’s important for all of us to remember Aaron, and to carry forward his good work. I have previously written the White House, my Senators, and my Rep about the absurdity and evil of the level of prosecution intended by the U.S. “Dept of Justice”. I will do so again. And again. For that is what justice requires. But I also confess to some anger with Aaron. He was brilliant, and always in a hurry. Too much of a hurry, in life, and in death. I actually worked at JSTOR when he “liberated” academic documents. I saw the server logs of the events. He essentially, presumably accidentally, did a DDoS on a bunch of their servers. And cost JSTOR a couple of man-days of effort tracking this down. The sad thing is, he could have liberated those same documents by ASKING FOR THEM. JSTOR doesn’t own them, they simply provide a service to search and retrieve them. Academics can always ask for large quantities of docs, and JSTOR usually finds a way to work with them. Hi, Charles. Good to see you here. Far as I know, nobody who knew Aaron (like most who didn’t) thought what he did with JSTOR was a good or right thing. Quite the opposite, in fact. I’m sure he felt the same way, after the fact. When I was seventeen and in full obedience to my heart’s most urgent commands, I stepped far from the pathway of normal life and in a moment’s time ruined everything I loved — I loved so deeply, and when the love was interrupted, when the incorporeal body of love shrank back in terror and my own body was locked away, it was hard for others to believe that a life so new could suffer so irrevocably. But now, years have passed and the night of August 12, 1967, still divides my life. What the protagonist of that book did was burn his girlfriend’s family’s house down. He meant to do something less than that, but he knew he was doing something wrong and risky and illegal. And he did it for love. Aaron was ten years older than this guy, but he was still given to obey the impulses of a young man in full obedience to his heart’s commands. Now the divide in Aaron’s life is between death and promise. A terrible waste of a wonderful life. Many others who knew Aaron speak of their frustration and anger, as well as their love for him. I feel some of that anger too. Suicides are acts of desperation and far less rational than rationalized, especially when committed by healthy people with abundant promise. What I wish Aaron could have seen is the near-infinite pain his suicide would cause to those who loved him most, and the permanent scars it would leave over the wounds to their hearts. If he could have seen that, I doubt he would have gone through with it. He was a good and loving guy. But now there is nothing anybody can do, but slowly heal, and try to carry forward the best of what Aaron worked for. I agree completely, Doc. I just wanted to speak to “the other side”. Meaning, that we often feel anger at those that we’ve lost, even as we grieve for them. Your acknowledgement says it better than I could.